Well, if Supersymmetry were just one year old, proposed say by Arcano Hamelin, a very smart and prestigious theoretician, everybody would be terribly excited about it. The SUSY little hierarchy problem would be simply dismissed as very little, the SUSY option would be considered to be obviously superior and more elegant than any of its competitors and your pie would be drammatically different. You know, for being such educated individuals, we sure can be rather dense. Its rather ironic that years worth of higher education, and stress going through the junior faculty shuffle and the eventual tenure process and so forth and it all comes down to a roulette wheel --Literally. Okay, so here is a question about that little pie you gave here. 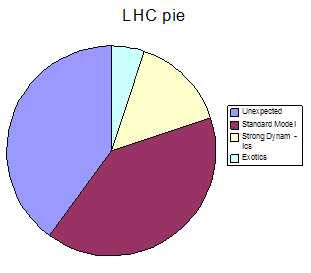 Given our perfect hindsight in this the year 2007, what would it look like if we decided to a draw a pie like this characterizing the finds of the Tevatron? mcc, i guess my pie would be dominated by "nothing". Again, LEP and others indicate there is no spectacular new physics below 1 TeV. Surely, the "unexpected stuff" is exotic, no?! I maintain the childlike belief that there could be a simple and spectacular answer to some of these question within an ordinary quantum field theory. That there is something we are missing. Something obvious in hindsight, but very tough to pinpoint without a hint from experiment. There are four extremely short but *unaddress* points that I made in a quick series of posts to the moderated research group that are linked to the above address. Bilge... LLTNS!... how have you been? Don't worry anonymous. I'm sure your job will be safe for a long long time. I'm reading "The Computational Universe" and thinking that this thing is probably more complex than we've even begun to imagine. I'm sure we will discover lots, and the biggest discovery may very well be that there is so much more to discover.